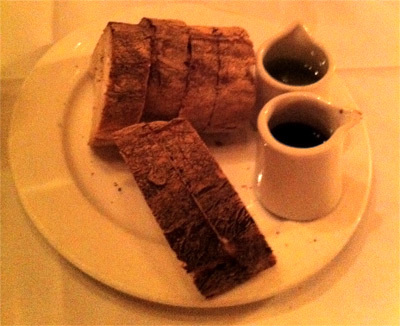 Serratto offers Mediterranean cuisine with a particular focus on Italian-inspired dishes with entrees ranging in price from the high teens to low 30s. Right off the bat, Serratto has its location going for it right there in the middle of NW 21st Avenue – there’s a lot of foot traffic wandering to and from the ritzy Portland equivalent of Beverly Hills’ Rodeo Drive, 23rd Avenue. Parking can regularly be a problem in the Northwest quadrant, and seeing as how it’s such a beautiful area to walk in, I highly recommend heading a little off the beaten track to Pettygrove. Between 23rd and 21st, Pettygrove has a plethora of free street parking with no hour limits during the evening hours, and also gives the excuse of enjoying one of my favorite parts of Portland – its walkability. Serratto offers a number of different seating options – from sitting at the bar to nice living-room style chairs surrounding intimate tables as well as more traditional table and chair combinations. Obviously, the soft lighting intends to relax – this is not your rush-in-grab-a-slice-of-pizza-rush-out place – you need to plan to spend a few hours here. Due to a particularly full house and one of my party being smart enough to make a reservation in advance, we ended up in a private room usually intended for parties spending a minimum of $600 (I’ll pause here for a minute so you can pick your jaw up off the floor). The wine list offers a wide variety of bottles from Italy, France, Spain, the Pacific Northwest and elsewhere with prices ranging from the high 20s to in excess of a few hundred dollars. Restaurants and food carts in Portland are renowned for taking simple ideas and adding a little to class to them, and Serratto is no different. Following the bread course (is bread actually a course? ), we ordered Pommes Frites (french fries) served with a garlic aioli (mayonnaise) and ketchup as well as Anderson Ranches Lamb Albondigas (meatballs). 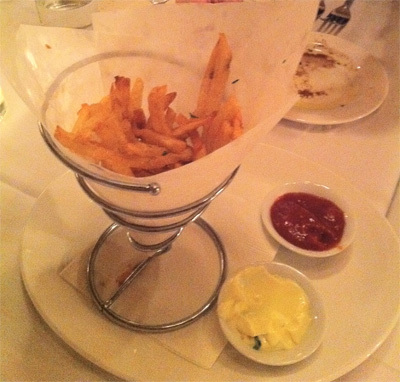 The Pommes Frites are absolutely delicious with the subtle garlic aioli adding a surprising amount to their overall flavor. The Albondigas, though also mouth-watering, caught me off-guard due to their diminutive stature. One of my favorite meals of all time came from a Greek restaurant: simply a heaping helping of meatballs the size of racquetballs smothered in cheese. Serratto’s Albondigas were the size of small 5-cent gumballs (do they still exist? ), and there were only eight in the appetizer. Though intensely flavorful, they left the table wanting for something more substantial – even as a starter. However, if the biggest criticism I can come up with is “the portions were too small,” then that’s really saying something. 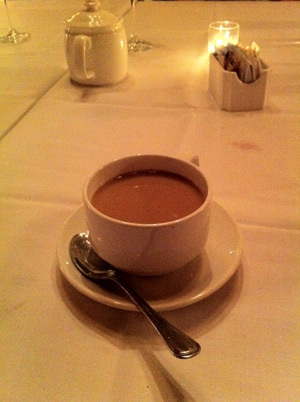 I ordered the French Onion soup to follow the appetizer. 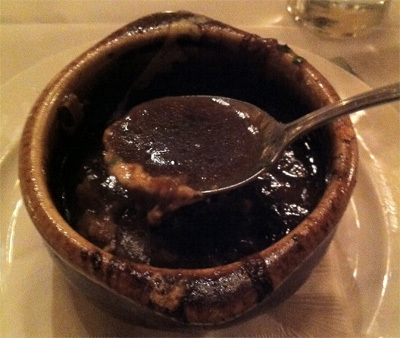 Usually, French Onion soup is served with a sheet of Gruyere cheese melted over the top of a individually-sized pot of soup with a piece of seasoned bread soaking inside in a vain attempt to disguise the fact that the diner is about to have a heart attack five minutes after finishing. Serratto skipped the melted Gruyere on top, opting instead to place small pieces of cheese in the soup. Though at first I was disappointed by this oversight, the soup itself was incredibly tasty, with large chunks of onions in an excellently-balanced broth which expertly distracted me from the lack of artery-clogging dairy products. For my entree, I chose the Roasted Draper Valley Chicken with the parmesan-herb crust and garlic mashed potatoes. I must admit that I was actually more intrigued by the Painted Hills Burger, but opted out as the rest of my table was expecting a more typical dinner choice and would have made fun of me incessantly (I will get you next time, burger!). The chicken arrived juicy and not a second overcooked with an herb crust that was filled with flavor that somehow didn’t overpower the plate. 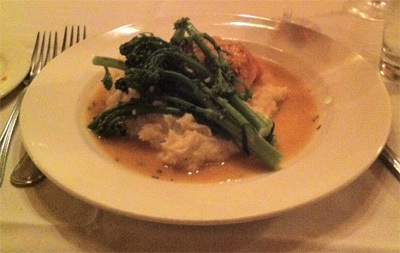 Balance, normally a tricky thing, achieved with a side of garlic mashed potatoes and some lightly seasoned broccoli (which caused one of my dinnermates to cringe in fear – a well-developed hatred for broccoli likely arising from some childhood trauma, no doubt) . In short, the entree was good. In long, it was gooooooooooooooooooooooooooooooooooooooood. For dessert, I opted for the warm Milk Chocolate Cobbler with Vanilla Bean Gelato as I always have been and most likely always will be a sucker for anything chocolate. For the first few bites, the dessert wasn’t as sweet as I anticipated, however I found myself grateful for that after several mouthfuls – it was delicious and had it been any sweeter, it would most likely would have been too rich to finish. Unlike many restaurants who still think the Internet is a passing fad like bell-bottom jeans or low-hanging pants (wait, both of those are still popular in the Southeast land-that-time-forgot quadrant), Serratto puts all of their menus conveniently online their website, so if you’d like to check out their very reasonable happy hour and lunch menus, you can do so at your own leisure. Serratto has a lot to offer for those seeking a slightly more upscale dining experience, particularly for dinner, with a delicate atmosphere coupled with a wide variety of dishes. If you’ve got a couple twenties burning holes in your pockets, and would like a well-balanced and flavorful Mediterranean meal, do yourself a favor and check out Serratto.